One new feature of Bb Learn is the filter option in the Grade Center. 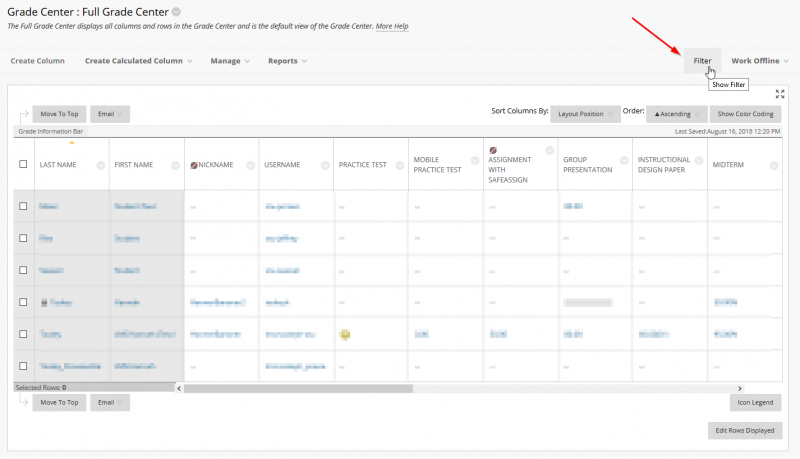 You can filter out columns by Grading Period, Assignment Category, Grade Status, and more. This makes it much easier to find the grading columns you need quickly. 1. 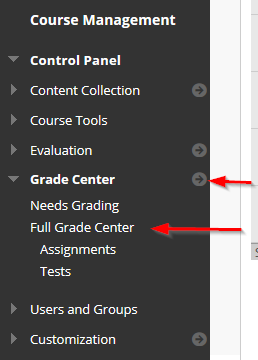 After logging into your course, click on the grey arrow next to Grade Center to access the Full Grade Center. If the menu expands, you can always click on Full Grade Center from the menu options. 2. In the top right corner of the Grade Center, you will see a button called "Filter". Click on it to see all your filtering options. 3. A white bar will appear underneath the Filter button with three different menus; Current View, Category, and Status. You can hover your mouse over any of the three menus to view your filtering options. 4. In the "Current View" menu, you can sort your grade columns by Grading Periods or Smart Views if you have set them up previously. 5. Under the "Category" menu, you can choose to view any grade column by their assignment category such as tests, discussions, or attendance. 6. 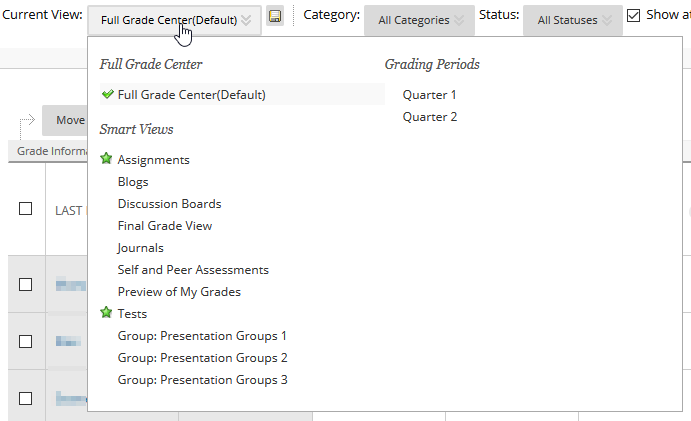 In the "Status" menu, you can view grade columns by their grading status such as Completed, Exempt, Needs Grading, etc. Note: If at any time you need to return to the Full Grade Center , go to the "Current View" menu and click "Full Grade Center".